Des McAnuff, who ably demonstrated with Jersey Boys that he knows how to do a really good jukebox musical, directs Summer: The Donna Summer Musical at breakneck speed and with all the depth of a Wikipedia entry. 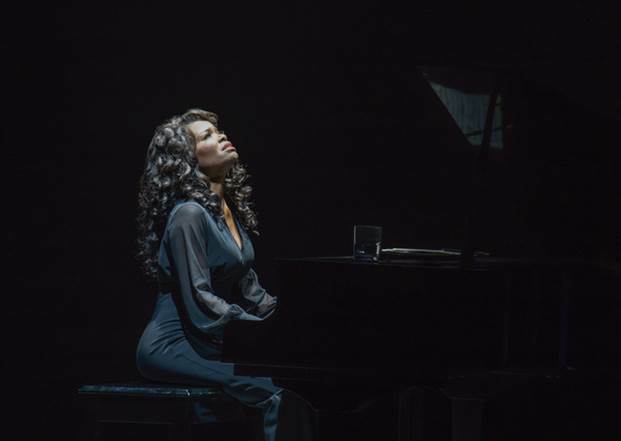 The show can’t make up its mind if it’s a tribute concert or a bio-musical. Who cares? Summer is all about the songs, those disco anthems that still get airtime forty years later. Summer clocks in at 100 minutes, with 23 songs, which doesn’t leave a whole lot of time for plot. But, oh, those songs! The audience sighs en masse at the first notes. Paul Tazewell’s costumes work well with excellent wig and hair design by Charles G. LaPointe. Gareth Owen’s sound design comes from the “louder is better” school. Projections by Sean Nieuwenhuis seem a little lackluster, by current Broadway standards. Sergio Trujillo’s choreography is mostly fine, with a few flashes of excellence, and it’s good to see some old-school Hustle on that stage. The basic plot is the same showbiz story you’ve seen over and over, in bio-musicals. Three actors play Donna; a talented little girl who just wants to sing (here called Duckling Donna, in a terrific performance by Storm Lever). 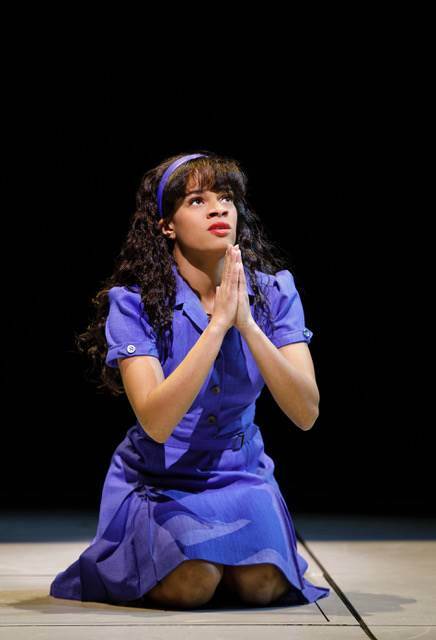 She grows up and gets her break/becomes a star (Disco Donna, played by Ariana DeBose). Over the course of her life, there are some hardships and some abuse and some triumphs and some groundbreaking. The mature Donna returns to Jesus and family (Diva Donna, the awe-inspiring LaChanze, who also narrates). This cliché-on-steroids is scored to every hit song from Summer’s career, plus some less well-known tunes. The songs mostly fit the plot. Sometimes, a song comes out of nowhere, but again, who cares? Any time is a good time for “Bad Girls.” Then there’s “On The Radio,” cobbled in to a plot point so ham-handed that it strains belief. Yeah, so? The audience is boogieing in their seats anyway! Diva Donna, the narrator of this “concert of a lifetime,” talks about looking back on her life in fragments – not mirrors (not even a mirror ball, although several appear), or paintings (Summer’s own paintings show up later, as part of Robert Brill’s scenic design). “Fragments” makes an excellent excuse for non-sequential storytelling, which can be confusing. Diva Donna also plays her own mother; Duckling Donna and the actors who play her young sisters double as Diva Donna’s daughters. 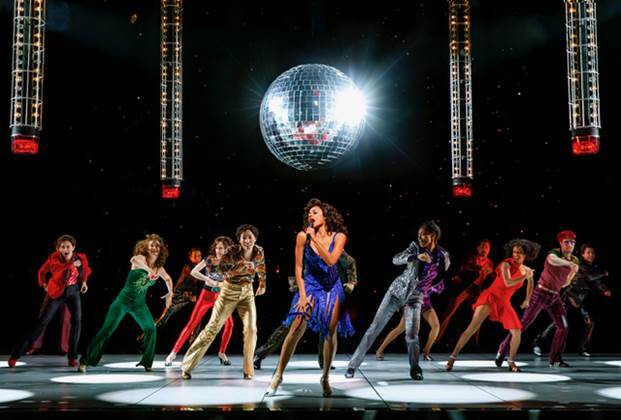 Almost the entire cast is women, sometimes playing men, which Diva Donna explains by talking about how women’s roles were really changing, and that it didn’t matter if you were a girl or a boy or anything in between, as long as you wanted to dance. The gender fluid ensemble is not the only nod to the LGBTQ community; in a squirm-worthy scene near the end of the show, Diva Donna tries to absolve herself from her famous “Adam and Eve, not Adam and Steve” remark. Total misfire. 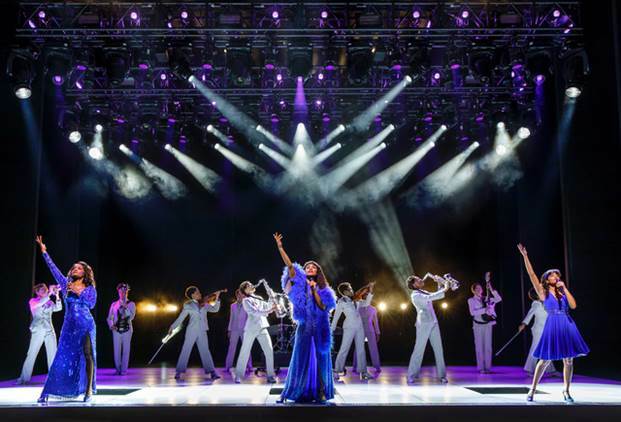 In the end, Summer: The Donna Summer Musical paints an upbeat, appealing, if confusing, concert-style picture of the Queen of Disco, hardships, triumphs, Jesus, and all. If you liked her music, you’ll like the show; let Summer’s ear-candy wash over you, and enjoy.